An IMPD officer was injured in a crash with an alleged drunken driver early on Sunday morning. 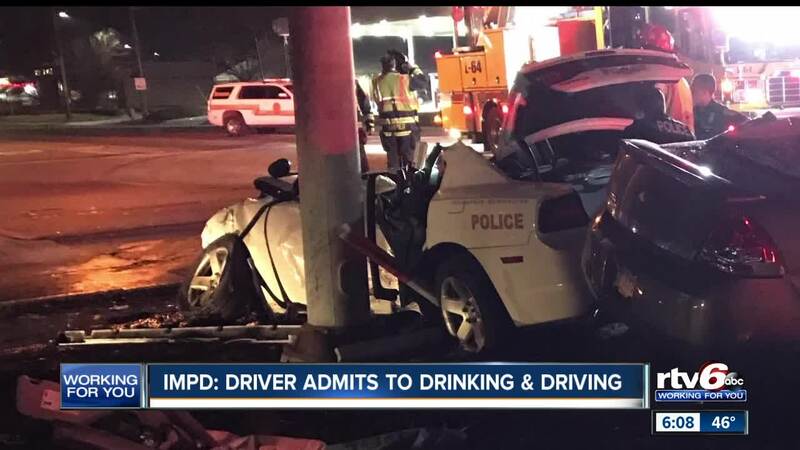 INDIANAPOLIS — An Indianapolis Metropolitan Police Department officer injured in a serious crash early Sunday morning with an alleged drunk driver has been released from the hospital. The officer was struck around 12:40 a.m. by a Chevy Impala turning left onto West 34th Street from Lafayette Road, according to a press release from IMPD. The officer was unable to avoid the Impala, spun and struck a utility pole. The Impala struck a light cabinet and utility pole. Both the officer and the driver were rescued from their vehicles by Indianapolis Fire Department firefighters, according to the press release. The alleged drunken driver was transported to Eskenazi Hospital in serious condition. The officer was taken to an area hospital for the possibility of a concussion and internal injuries. Both the officer and the alleged drunken driver lost consciousness as a result of the crash. Police say the driver of the Impala told them he had alcoholic beverages on Saturday evening. A blood draw was given to both the driver and the officer, which is standard procedure for crashes resulting in serious bodily injury, police say. The officer is not suspected of being under the influence. The officer was released from the hospital sometime Tuesday evening. The other driver's updated condition has not been released. IMPD accident investigators say they are waiting for the results of the blood draw and have not arrested the alleged drunken driver.